My first post on the Astros was Astros Offense On Record Setting Low Pace. Right now their OPS is .630 and the league average is .727. So .630/.727 = .867. To convert that to a rate, we multiply it by 100. That would round off to 87. The last time any team had a relative OPS of less than 87 was in 1972, the Rangers, with an 86. Data from the Lee Sinins Complete Baseball Encyclopedia. The Astros have an OPS+ of 70 according to Baseball Reference. It takes park effects into effect as well as the league average (it is calculated a little differently than above). The lowest team OPS+ I found going all the way back to 1920 was 69 for the 1920 Philadelphia A's. So the Astros are close to that. The Blue Jays have an isolated power (ISO) of .206 since their SLG is .445 and their AVG is .239. That is higher than the all-time record of .204 by the 1997 Mariners. Relative to the league average, it would be the third highest since 1900, at 141 (.206/.146 = 1.41). The league ISO in the AL this year is .146. The 1927 Yankees are the highest at 153. My first post on this was Blue Jays On Record Power Pace. That may not be an earth-shaking headline. But considering that they also led the league in OPS+ and DER (defensive efficiency rating), that is impressive. Probably not a big surprise since they are often seen as the greatest team ever. I wrote a post a few weeks ago called What You Don't Know About The 1927 Yankees. It discussed some of their statistical accomplishments. Their won-lost record of 110-44 actually understates how good they were. The table below shows how the teams ranked in FIP ERA. 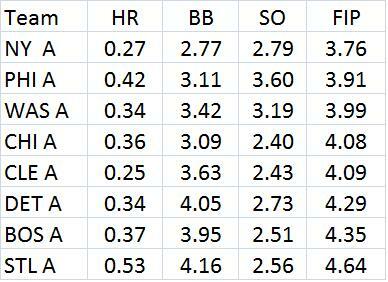 FIP ERA = Constant + 1.44*HR + .33*BB - .22*K (in this case HRs, BBs, and Ks are per 9 IP). The constant = League ERA - (1.44*HR + .33*BB - .22*K). The idea is to see how good pitchers are based on the outcomes they control. I think it was created by Tom Tango and is a little like DIPS ERA created by Voros McCracken. DER is percentage of batted balls turned into outs. See the first post linked above. OPS+ is 100*[OBP/lg OBP + SLG/lg SLG - 1]. It is then adjusted for park affects. The 1927 Yankees led the league with 128. The next highest team had 99. To see the stats for that year, go to this Baseball Reference link: 1927 AL Team Hitting Stats. There probably are not many teams that lead the league in FIP ERA, DER and OPS+. If I find any more, I will report it. It means they had the best pitching, fielding and hitting. Some combination. Are doubles and home runs disproportionately valuable in high scoring environments? "Doubles and home runs are disproportionately valuable in high scoring environments than low scoring environments, because their runner-advancing potential is greater when there are more runners on base. In a high-scoring, a home run is more likely to score other runners, and someone who hits a double is less likely to be stranded on second base." I wondered if this were true. So I looked at the run values of various events from Tom Ruane's article called The Value Added Approach to Evaluating Performance. Tom used Markov Chains to find the run values of various events in each league, year-by-year, from 1960-2004. For example, in 1960, in the AL, a single had a run value on average of .464 while a HR had 1.419. What I did next was find the following ratios, by run value, for 2B/1B, 2B/BB, HR/1B, and HR/BB. Then I found the correlation of those ratios with the runs per game for each year. Here are those correlations for each ratio. The negative correlations indicate that as scoring goes up, the value of HRs and 2Bs, relative to other events, falls. I checked the scatter plot for the first one to see if there was any sort of non-linear pattern like a parabola, but there was not. Here were the top 5 years in terms of HR/1B ratio. The numbers in parantheses are the runs per game in that environment. Walks were non-intentional walks. Most fans probably know that these were low scoring seasons. In the 1972AL, the run value of a HR was 1.444 while the value of a 1B was .421. 1.444/.421 = 3.43. Here were the bottom 5 years in terms of HR/1B ratio. Notice how these are much higher scoring seasons. In the 1994AL, the value of a HR was 1.399 while it was .489 for a 1B. Tom Tango (tangotiger) came up with run values for various events using Baseruns. This is at Custom Linear Weights Values by Team Generated using the BaseRuns system. He looked at all teams from 1919-2000. I ran the same correlations as mentioned above but did not include 1919. Here they are. They show about the same pattern as above. HRs and 2Bs have less relative value in higher scoring environments. Tom Tango had a good discussion of this issue at Reader Mail of the Day: Environment impacting events .